A gentle prayer. Feminine role models in an uncertain age. These holy cards offer something special for women and men, young and old alike. Packs of 100. Plenty for friends. From the back of the card: "Lord, our God, you graciously chose St. Dymphna as patroness of those afflicted with mental and nervous disorders. She is thus an inspiration and a symbol of charity to the thousands who ask for her intercession…". 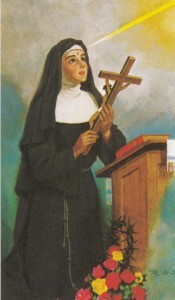 From the back of the card: "O God, who didst vouchsafe to communicate so great grace to Saint Rita that she imitated Thine example in the love of enemies and bore in her heart and on her countenance the sacred marks of Thy love and passion…". From the back of the card: "St. Therese, the little flower, please pick me A rose from the heavenly garden and send it to Me with a message of love……".